Pumpkin soup is one of my favorite fall and winter soups. 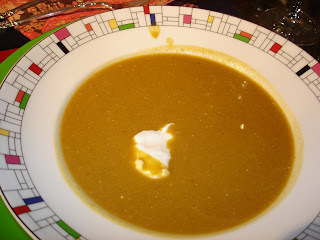 I wanted to create a creamy, smoky pumpkin soup with just a hint of spice. That was the inspiration for this soup, which served as the third course at our seven course dinner party Saturday night. In addition, I included some cashew butter in the soup that I made from fresh pureed cashews, since I have always enjoyed the pumpkin cashew soup at the nearby restaurant, Rosewater, here in Park Slope, so that served as an inspiration here because of their commitment to using seasonal, organic produce in a "farm to table" type of cuisine. This soup was a very enjoyable course at our winter dinner party for our out of town guests. First, prepare the cashew butter by chopping the cashews finely in a nut chopper. Then blent the cashews with 1 T of water and 1 T butter in the cusinart until a cashew butter is formed. Set aside. Bring the chicken broth to a boil. Add the three cups of pumpkin puree. Make sure to use plain pumpkin puree, and not pumpkin pie filling. After whisking in the pumpkin puree, whisk in the cashew butter, honey, maple syrup, spices and chipotle. You can adjust the spices to taste, since that's what I did when I was preparing the soup. Reduce to a simmer and stir occasionally for 15-20 minutes. If the soup is too thick, you can add an extra half cup of chicken broth. Remove from the heat and mix in the remaining 3/4 to 1 cup of creme fraiche. I added an entire cup, which made the soup creamy and delicious. To serve, ladle the soup into bowls and serve with a little cinnamon and a small dollup of creme fraiche. Just a note, the soup acquires a little spice from the chipotle and a bit more from the pinch of cayenne pepper. You can leave out the cayenne for less heat, but I wouldn't suggest removing the chipotle, because that only adds a little heat, and an important smoky quality to the soup. Pumpkin is one of the ingredients of the month on Akitcheninbrooklyn. Click here for Gilly's Vegan Pumpkin Pie and here for my Pumpkin Creme Brulee.